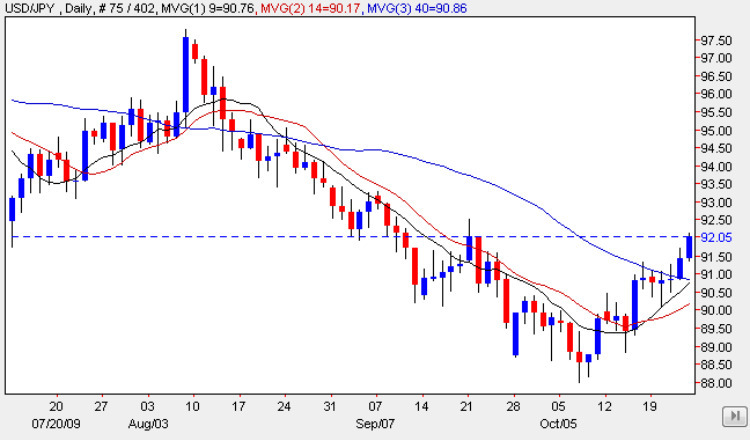 The yen to dollar pair continued the recent strong rally once again on Friday, ending the trading session with another wide spread up candle, adding to that of Thursday, and more importantly breaking above the minor resistance level in the 91.50 price region, suggesting that this trend has some way to go. This view is also confirmed by the 9 day and 14 day moving averages which are all pointing sharply higher, and with the 40 day now crossing the latter of these, this is adding to the bullish picture. Whilst this recovery will no doubt be welomed by the Bank of Japan, for any sustained longer term move, we will need to see the deep resistance now ahead breached once again, and which may prove to be a more difficult obstacle to overcome. The weekly chart for the yen to dollar is also revealing as it suggests that we may be witnessing a double bottom forming, with the floor in the $88 region, but for this to be confirmed we have some way to go, with a break above the 100 being the first signal that this has indeed occurred. Whilst this is well above the current price level, it will be an interesting technical development to watch over the next few weeks, and if confirmed, could see the currency pair surge higher back towarsd the 110 price handle in due course. With no items of fundamental news for either Japan or the US markets will be taking their cue from unexpected, breaking news or simply drift. You can keep up to date with all the latest fundamental news on the economic calendar, latest currency news and live currency charts by simply following the links. I have also included details on an excellent ECN broker.